Anthony Perkins and others wear optical white and black high top Converse “Chuck Taylor” All Stars in the film. June goes into a swoon for Ray Blent, Custer College’s star basketball player. Tall Story is a good example of a fifties-style romantic comedy, in the tradition of the Doris Day films that were popular then. Instead of Doris Day, Jane Fonda makes her film debut as June Ryder, a young coed matriculating at Custer College. She isn’t going to college to study curriculum, but instead has a “master plan”, become romantically involved with Custer’s star basketball player Ray Blent (Anthony Perkins). Besides, Ray and June, the film also focuses on two college professors: long time bachelor chemistry professor Charles Osmond (Marc Connelly) and his new neighbor and faculty colleague Leo Sullivan (Ray Walston), who has just been brought to Custer College as the new professor of modern ethics. The plot unfolds when June, riding through campus at breakneck speed, collides with the two professors. When she finds out who she has run into, June quickly asks which of their two courses she should take, as she can take one of them as an elective. When they ask her major, she reveals her plan, saying that she is choosing between the two of them because Ray is scheduled to take both classes. Both professors cannot believe what they have heard, and each pledges to take the other out for coffee if June is in the other’s class. But as it turns out, June ends up persuading the dean to let her take both classes. June is thrilled to hang onto Ray’s Converse All Star. June soon is successful in her pursuit of Ray. By always being by his side, in class, as a cheerleader for the basketball games, and then socially, she gets the somewhat naive Ray to respond to her desire for a relationship. Eventually, they start to make wedding plans, but Ray realizes that he can’t afford it at present. Meanwhile, the college is all a-buzz with the news that the Russian national basketball team, which is on a national tour, will be coming to play the Custer team. A lot of money is being wagered locally, and an anonymous gambler leaves an envelope of cash in Ray’s taxi (he works as a driver part time). The gambler gets access to the dispatcher and tells Ray now that the money is there in his possession, he must throw the game. Unsure of what to do, Ray decides to avoid playing the game at all by deliberating flunking his Ethics exam the day before the game, which makes him ineligible to play. Because of the high stakes in the college community for the game, however, a lot of pressure is put on Professor Sullivan to re-administer the exam to Ray, which is of course a direct affront to his view of himself the high moral arbiter of ethics at the university. The farcical interaction and comedy of errors by all of the principals and the Custer community at large as they conspire to figure out a way for Ray to play, makes up the balance of the story. Ray’s laced up for some full court presses, but not like the the one that June has in mind. Tall Story takes you back to a very different time in America, and the attitudes and conventions of all involved reminds you of how much things have changed in the last forty years. The views of gambling, sportsmanship, the roles of the sexes, and what college life is like bear little resemblence to today’s world, but 1960 was a much more innocent time, and the role of women in society was very home-oriented. Nevertheless, there are still some characters in the story you would easily recognize in today’s world, like the overambitious basketball coach, the down to earth professor’s wife (Anne Jackson), and the manipulative kid who gets to stay up late when he discovers Ray and June necking in the living room (while they were babysitting for the Sullivans). You feel the atmosphere of the times in the way the film was shot, its direction by Joshua Logan, and even the title song, sung by Bobby Darin. And when you think of the evolution of Jane Fonda’s career, it is interesting to see how Hollywood first thought of her as following in the tradition of Doris Day. She was quite good in that tradition, and it is fascinating to see Anthony Perkins in a pre-Psycho comedic role. 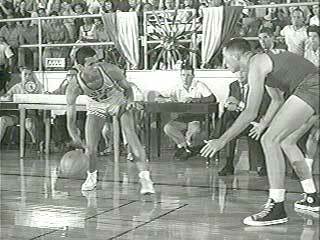 Ray scores a key basket in the game against the Russians. The coach and district attorney are so eager to Ray to get in the game, they lace his chucks for him. Anthony Perkins is the chucks wearer in this film, but because of the college dress code of the time, you only see him wearing his chucks on the basketball court. 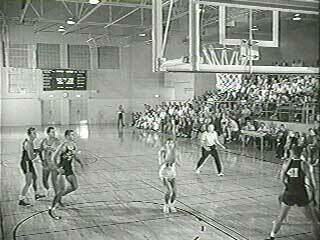 But there are some good basketball scenes in Tall Story, especially during the game with the Russians. Because the film is shot in black in white, it actually enhances the look of the Chuck Taylors you see on screen. Ray dribbles past the Russians. Tall Story. (1960) Anthony Perkins, Jane Fonda, Ray Walston, Marc Connelly, Anne Jackson. Directed by Joshua Logan. Categories: Comedy, Romance.